This volume comprises a speech which lasted from the 15 th to the 20 th October, 1927, delivered by Ghazi Mustapha Kemal Pasha, President of the Turkish Republic, at Angora before the deputies and representatives of the “Republican Party” of which he was the founder and head. Unconventional as the length and character of this speech is, the subject of it, which is a comprehensive account of one of the most remarkable events in the many centuries of Turkish history, is equally unique. It reveals the activity of the speaker from the time when he first felt himself called upon to take the leadership of his nation into his own hands and guide it from shame and threatened ruin to freedom and power. Now that danger from abroad has been averted and since the foundations have been prepared in the country on which a revivified State is arising, Mustapha Kemal Pasha is moved to show his people how this new Turkey has been built up, on what foundations she is standing and what are the paths she must tread in future. The speech was delivered before Turks by a Turk, by a man who from the commencement of his military career was intimately associated with the political events occurring in his country; before men who, like himself, have lived to witness or to share in the two eventful decades of the modern history of his native land. This fact alone will explain that the speaker presumed many a circumstance to be perfectly well known to his hearers with which the reader is not familiar. The present Turkish State under its new Constitution is an extremely democratic republic, which emphatically declines to be influenced by religious considerations. As an easily to be understood, and we may even say inevitable counter-blast to the close connection existing for many centuries between the most absolute monarchy and a religion permeating every sphere of private and public life, the freedom of the citizen and the complete separation of State from Religion have become the battle-cry of the present day. The most liberally conceived Western ideas are accepted with the most jubilant enthusiasm. Western development, civilisation, progress are the aiTT>5 and substance of the efforts that were made. But the main object of all the anxiety and all the bitter struggle is the nation itself, the people of Turkey. In the West the national idea has a long and variable history; in the East it is new, and with ail the ardour and the exalted flight of imagination of which an unexhausted people are capable of concentrating on a new ideal, it is seized upon and contended for in the leading circles. It is evident that between these two ideals, the civilising and the national, conflicts and dissentions must arise. Extensive adoption of the western or, at all events, foreign advantages of culture on the one hand, and the maintenance of their own native culture on the other, is the main choice that new Turkey has to make. Historical development never advances by leaps and bounds, but is the consequence of mutually recognized stages. 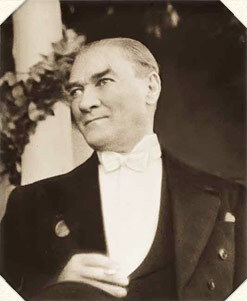 It is the same in regard to Turkey, but here also, through the prolonged resistance of stubborn elements and the moral pressure exerted from without, the effects of which were felt even in the most remote districts, and, finally, through the appearance of a great leader, the last phase of the development occurred with remarkable rapidity. During the first half of the 19 th century efforts to reform the obsolete political system of Turkey could already be observed. At that time it was the Sultan himself, Mahmud II the c Reformer” (1808 1839), who, succeeding Sultan Selim III, was amicably inclined towards reform and who made these attempts. Besides the annihilation of the over-powerful and irregular corps of the Janissaries, the proclamation of reform of the year 1839, known as the Hatti Sherif of Gulhine and published after the death of the Sultan, is of historical importance. But unfortunately this attempt at reform remained dormant from its inception. The .successors of Mahmud had neither the understanding nor the strength for leadership. At first they had a retarding influence and afterwards were the declared enemies of every kind of development. While the Turkish Empire, which at one time had made Europe tremble, came politically and economically by degrees more dependent upon the Great Powers, these rulers unswervingly upheld the ancient ideas and antiquated institutions and squandered the revenues of the State and allowed its most important means of power to lie idle. A class of educated men who dreamed of restoring the Turkish Empire to its former glory and who were increasingly influenced by liberal Western ideas in the 19 th century, became impressed with the new ideas. Under the leadership of Reshid (1802 1858) and later of Midhat Pasha (18251884) they succeeded, after overthrowing the versatile but politically inept Sultan Abdul Aziz, in obtaining the grant of a new Constitution to Turkey in 1876. But already in the following year all the hopes attached to this event were suddenly destroyed. Abdul Hamid II, the second successor of Abdul Aziz, had overthrown his brother Murad V and under the pressure of the prevailing conditions had granted a new Constitution. Several months later this was again withdrawn. Midhat Pasha was exiled, and for a whole generation the dark cloud of reaction, of which one could scarcely form an idea in the West, lowered upon Turkey. The figure of Abdul Hamid and his activity belongs in a measure to our own time, and the secrecy surrounding this undoubtedly important ruler has added to the interest taken in him. In the country his interest was chiefly directed towards the suppression of any modern or independent movement, and every means was welcome for the attainment of this aim. Drastic control of religion, which was connected outwardly with Panislamic endeavors, a system of espionage to an extent never previously experienced ramifications of which were intended to serve the purpose of spiritual guardianship and supervision hitherto unknown were among them and, indeed, they fulfilled their purpose for several decades. Banishments and executions the latter mainly in secret which the Sultan inflicted upon his adversaries or those whom, in his fanatical and ever-increasing distrust, he considered to be such, were innumerable. But spiritual development could not be arrested, the counter-pressure against that exercised from Constantinople was slowly growing and expanding. In the nineties there arose in Macedonia, especially at Salonika, the “Committee of Union and Progress” in which undoubtedly important moral forces were at work*). Kemal Pasha, at that time a young officer on the General Staff, also belonged to this movement. The hour of deliverance arrived in 1908. In July open rebellion broke out against Tyranny. The Sultan, notwithstanding his system of spies, was unprepared for this blow and did not immediately grasp the situation. This time, however, the prudent man had miscalculated the situation. With surprising rapidity the Macedonian troops reappeared before Constantinople, even before the Sultan s auxiliary troops from Anatolia could reach the spot. After a bitter fight, the garrison of Constantinople was defeated. Abdul Hamid lost his throne and his liberty, and Mehmed V was proclaimed Sultan in his stead. The windows of the old Turkish edifice of State were thrown open amidst scenes of wild enthusiasm. But the building itself remained the same. Revolutionary as the beginning of the regime of the Young Turks was, they still remained in their character a party seeking development and not revolution. This is neither the place nor exactly the proper time in which to pronounce final judgment on the “Committee of Union and Progress.” Their rule was short ; lasting scarcely ten years, it was by no means free from attack within the country and was constantly threatened by violent storms from without. The annexation of Bosnia and Herzegovina by Austria-Hungary and the declaration of independence by Bulgaria introduced a chain of political catastrophes affecting foreign policy, and from the time of the Turco-Italian war and during the whole of the World War this decade was almost entirely filled with bitter warfare. If the wise diplomacy of Abdul Hamid had been able to steer the weak state financially and militarily through the foreign political dangers threatening it on every side, his less able successors were totally unsuccessful and it was impossible in this short and tempestuous period to eliminate the material and psychological results of the past. But in any case it may be admitted that the revolutionary period of 1908 and 1909 exercised a powerful moral influence. Forces were liberated which hitherto had been able only to work in secret and under constant pressure, or else lie dormant. Side by side with powerful leading figures, who in the realization of their power, their energy and their unscrupulousness in the choice of their methods recall the Italian Renaissance, stand representatives with, remarkable minds. Perhaps, even the existing inclination for spiritual experimentalisation with different problems and the long time of forced theoretical preparation were not consistent with the practical activity of the party that had come into power. Ideals, such as the Pan-Ottoman or Turanian that dreamed of a union between all the Turkish tribes in Asia, or like the Panislamic that considered it justifiable to claim the unity of all Mohamedans, or the Osmanli that imagined as happened in old Austria that the dynasty could be regarded as a firm link connecting all the tribes peopling the wide Ottoman Empire, were interwoven in such a manner as to produce a policy that lacked the capability of establishing reforms and had no definite aim to inspire it. The edifice of the State in its essential parts still remained in existence and with it the grave evils of cliquism, of spiritual and material corruption, of religious conservatism and of the fatalist tendency of which the Turkish State and the Turkish people had been suffering from for a very long time. All the exalted ideals referred to broke down and were shattered by the inexorable demands on real vital strength, which resulted naturally from the war. It proved that the foreign nations, whether they were Balkans or Armenians, Greeks of Asia Minor or Arabs, felt the same as the Ottomans. It was also proved that English money and the power of the Western States triumphed over the sense of unity among the Mohamedans, and Enver Pasha was vanquished and broken in his fight for the Turanian ideal. One force, however, was at work during the years of liberation and survived the storm, and this was the conception of the Turkish national ideal. The beginning was made to free literature from foreign example both in form and language. The will to Achieve something innately their very own gained ground. Noble spirits felt themselves drawn into the task of co-operation in the common aim, and when, in the year 1910, Hamdullah Subhi Bey founded the national organization known as the “Turkish Hearth” an educational community aiming at the development of the national conscience he planted a sapling which has grown into a powerful tree, with ramifications throughout the country. The wars which undermined the existence of the old Empire also shook the hearts of the people. During the World War the Turkish officer and soldier no longer fought for the Padishah alone, as they had formerly done. The appreciation of the value of, and anxiety for the existence of the country had been awakened. A spark still glowed when in the year IQI8 all hope seemed to be sheer madness a spark almost extinct, yet strong enough to brighten into flame when fanned by genius. At the end of October, 1918, after eight years of uninterrupted struggle, the resistance of Turkey was broken. Bulgaria had laid down her arms, communication with the Central Powers, who themselves had reached the limit of their strength, was cut. In Palestine and Mesopotamia the English drove the completely exhausted Turkish divisions northward in front of them. The end had come. The leaders of the Unionists, with the Grand Vizier Talaat Pasha, Enver Pasha and Djemal Pasha, surrendered and fled; Ahmed Izzet Pasha person ally assumed the difficult task of carrying on the affairs of the State. A commission under Rauf Bey, the Minister of Marine, went out to the Allied squadron lying in the Dardanelles. On the 30 October, 1918, Rauf and the English Admiral Calthrop signed the armistice at Mudros. Its terms were severe and inexorable. The Dardanelles and the Bosporus, as well as the forts commanding them, had to be evacuated and handed over to the Allies, the Army had to be disarmed and all ships surrendered. The Allies reserved to themselves the right to occupy every strategic point in Turkey should their safety” require it. Turkish railways were to be controlled by officers belonging to the Allies, all the Turkish harbours were to be thrown open to them, all telegraph lines were to be placed under their control. Turkish prisoners of war were to remain in captivity, Turkish troops fighting far from their homes in the Hedjas, Tripoli, etc., were compel led to surrender. The prisoners of war belonging to the Allies confined in Turkey were immediately to be liberated. It was originally stipulated that all the German and Austrian troops in Turkey were to be considered prisoners of war, but the Turkish Government under Ahmed Izzet Pasha categorically refused to agree to this and obtained their freedom. Their loyalty towards their comrades in arms in such a desperate position shows a remarkably noble side of the Turkish character, of which Germany must always feel proud. Allied and Greek men-of-war cast anchor before Constantinople, and a terrible fate gathered over Turkey. The maps accompanying these volumes clearly show what were the intentions of the Entente and speak for themselves in eloquent language. The stipulations of the Treaty of Sevres (in the summer of 1920), which Mustapha Kemal Pasha analyses at the conclusion of -his speech, prove that the Powers who pretended that they were fighting for the freedom and the self- destination of the nations had no hesitation in practicing the most glaring and unrestrained imperialism with regard to Turkey. They intended, beyond doubt, that it should be a peace of annihilation in the strictest sense of the word. By annexation, placing territories under mandate and influence, besides the erection of new vassal states, nothing was to remain of Turkey except a small district in the interior of Anatolia an island surrounded as it would be by foreign Powers, in which it would scarcely be possible ever to carry on political life or national power. Detachments of foreign troops occupied important points in the interior of the country. Foreign officers were ranging through it in all directions. When, on the 15th May, 1919, Greek troops landed at Smyrna with the consent of the Entente, treated the Turkish population as a subjugated class and prepared for the erection of a new Great Greece, the curtain had, apparently, risen on the last act of the Turkish tragedy. But this happened to be the hour of the birth of a new Turkey. The decision had already been made, Mustapha Kemal Pasha was already struggling to reach the shores of Asia Minor. The events during the following years are related in the pages of this work. They unfold a development of world-historical magnitude and importance. We are made aware in an overwhelming manner of the part enacted by a great leader chosen by fate, who keeps his high aim ever before his eyes unflinchingly, regardless of counsel proffered by those who thought they knew better than himself, who advances on his stormy path, who has the faculty of revivifying the flood pulsating from the heart of his nation that was thought to have run dry, and who presses everything and everybody into the service of a great conception. Of what a nation that does not lose courage but is resolved to the bitter end is capable, is shown once more by his example and, simultaneously, we are afforded an insight into the very soul of the Turkish people who misunderstood by those not intimately aquainted with them have never learned how to bend their necks under a foreign yoke. Mustapha Kemal Pasha s mission is not yet fully accomplished. What he publishes herein is the story of the birth of the new Turkey. Freedom from molestation from abroad, freedom within its frontiers to develop on modern lines and on a national foundation these are her twin guiding stars. Mustapha Kemal Pasha has pointed both of them out to his people. The preservation of this freedom from foreign interference and of this national development are the tasks of the future, and are fraught with dangers enough in every sphere of political activity. We pointed out at the beginning the great problems presented by the new development, the blending of all that was good, efficient and worthy in life, and at the same time consistent with the inherent character of the people, with all that is new but in so many ways essential. The magnitude of this task can perhaps be estimated when we realize that only twenty years ago the system of Abdul Hamid, with its enslavement of the spirit and its demoralizing system of espionage, was still flourishing. *) From the name of the “Committee of Union and Progress”, its members and adherents are often referred to in this volume as “Unionists”, while they are often described also as the “Young Turks”. It must be observed, however, that these two expressions do not mean exactly the same thing, because not all of the “Young Turks” were intimately associated with the “Committee of Union and Progress”.